Friday Favorites- Hungry Root Review & GIVEAWAY! If I said the words: Gluten Free. Dairy Free. Soy Free. All Natural. Vegan. Would you wonder, “is it also flavor free?” Not if it’s a meal from Hungryroot! Hungryroot offers amazing veggie noodle based meals served with a creative sauce that can easily pair with a protein (purchase with or without grilled chicken). Home cooks can prepare their favorite meals in less than 10 minutes on the stove top or in the microwave. All the meals are locally sourced, non-GMO and are gluten free. Many are dairy free and even vegan. This is the answer to all my food dilemmas! As a busy mom, with dietary restrictions, I often lack the time to prep healthy meals for myself. I spend so much time making meals I know my picky eaters will like that I am left at the mercy of hunger and I grab anything quick. I have dreamed of finding healthy organic convenience meals for years. Now, I can make a full sized healthy meal for myself before you can say chocolate chip cookie binge (OK more like 7 minutes). Every meal is less than 500 calories, rich in nutrients and already prepped! I placed my first order as a Christmas gift to me. I was curious to taste for myself how root noodles could compare to the taste of traditional pasta meals. I selected a gift pack of three full meals and one side and one dessert. Did I mention these FRESH healthy quick cook meals were delivered right to my door? I wasn’t home when my package arrived. But, the meals were all kept safe inside the insulated box with cooler packs. Incidentally, all the shipping materials are biodegradable and recyclable. Be sure to check with the local recycling guidelines in your area and read the directions on packaging before recycling. My husband raves over every meal we try! The man who could live on pasta with every meal- RAVES over noodles made from vegetables! I personally love the Rutabaga noodles with Mushroom Pistou Sauce and grilled chicken the best, but those Sweet Potato noodles with Creamy Cashew Alfredo and Roasted Falafel have me craving more! My picky little eaters and I are now addicted to the Coconut Carrot Cake Bites with coconut frosting (all vegan!). I can’t wait to try the Black Bean Brownie Batter and the Maple Chick Pea Pancake Batter! The cook time and the already portioned ingredients sold me on Hungryroot! A price point of $10-$12 per meal to serve 1-2 people may seem pricey for a family budget, but for this gluten/lactose/soy intolerant mama on a time crunch these super convenient meals really fit the bill! You all know how much I love a company that gives back. Hungryroot is a 1+1 company which means they donate 1% of their profits to charity and volunteer 1% of their time to support nutritional education and healthy eating. At the time of my purchase they were donating fresh meals to City Harvest a NYC based food rescue agency. Hungryroot meals are available through Hungryroot.com or FreshDirect and AmazonFresh. So, hungry for more? Well, nothing gets a Friday started like some free food am I right? The amazing folks over at Hungry Root are giving all of you the chance to win a fabulous FREE meal including dessert! Just enter below! Promotional product provided by Hungryroot. Financial compensation not provided for this review. All opinions provided herein belong solely to The Whatever Mom (and lots of other people who think Hungryroot has yummy food). 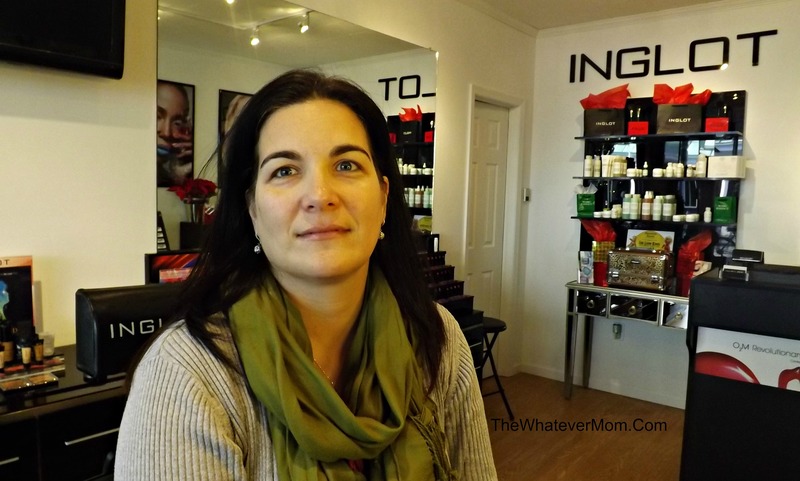 Friday Favorites- Perfectly Posh VALENTINE’S GIVEAWAY! No financial compensation was received for this review. All opinions expressed are tried and true and solely belong to The Whatever Mom.The links contained in this post are not affiliate links. Do you know why I love giveaways? It isn’t just because everyone loves free stuff. It’s because I LOVE treating my friends and readers to some really awesome products! I only share with you products I use in my own home! This week I’m in love with Perfectly Posh products! In honor of Valentine’s Day I am giving some for FREE! What made me fall in love with Posh products is they are cruelty free and never tested on animals, there are vegan options and everything is made with plant based natural ingredients. I love that I can pamper myself and my little girls without worrying about fillers and synthetic chemicals. Now I don’t mind sharing my products with them! You can find a list of product ingredients at Perfectly Posh. Of course you can also count on me to find a company that contributes to charity and a great cause! Through the You Deserve It charitable program Posh generously shares their products and raises funds for women’s shelters. They also collect needed items like socks and gently used shoes for women and children living in YWCA shelters. I don’t know about you, but for me buying products I can safely use with my children while supporting families in need feels like a really big win! This 10 oz. tub of awesomeness goes a long way! I use it every morning in place of perfume. Essential oils gives this creamy body butter a fragrance that lasts a long time without over powering. My kids and I both have sensitivities to strong fragrance, but this has no effect on our allergies! I use this rich body butter to moisturize before bed too! This skin stick has amazing super powers. I’m not kidding! The lemon powered scent is reviving and the caffeine helps with that over tired look. I have used at the beginning of a migraine and found relief! It really helps! I keep mine in the fridge for a nice cooling effect when I need that afternoon pick me up. This chunky bar is vegan and made with natural charcoal powder to draw toxins from the skin. The shea butter leaves a nice smooth layer of moisture and the scent is light enough for guys or gals. I use in the shower for a five minute spa effect. I’d almost forget I have kids if they weren’t yelling through the door. All products are Made in the USA and every item costs $25 or less! I know! That means you can afford to pamper yourself and share a little with the kids (although you might not want to share). Speaking of sharing it’s time for our giveaway! My very generous friend Stacey a.k.a Dr. Posh (yes she really does have a PhD!) 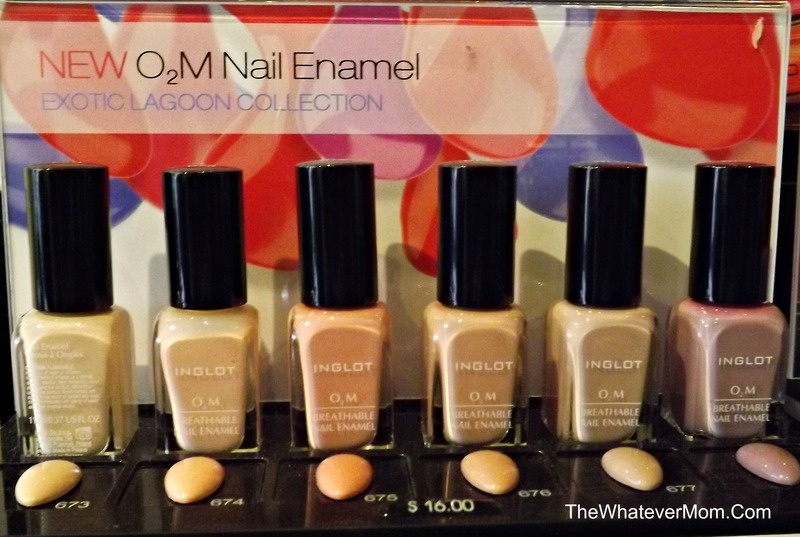 is sponsoring today’s Posh giveaway! Two readers will win a posh Valentine’s Day Treat! Be sure to comment below which item you would like to win! A full size Gender Bender Shower Bar, or a Starbucks travel cup filled with samples and Valentine chocolates! Don’t miss out on these amazing specials happening right now! If you are already a Posh fan then you won’t want to miss out on these freebies with purchase! You can also join the perks program and earn free products! Find out more here. Contest opens midnight Friday February 12, 2016 and ends February 14, 2016. Winners will be announced on Monday February 15, 2016 on The Whatever Mom Facebook page. If you are not following on Facebook yet, you can do so here. Why not sign up to follow the blog via email and never miss out on another giveaway again! January is the perfect time to re-organize things around the home. I like to start my “spring cleaning” now so that once Spring arrives I can be outside. One of the first rooms I tackle is our main bathroom. Scrubbing and cleaning the tile is essential, but I also like to clean out our storage closet and medicine cabinet. I toss out old or expired medicines and update my beauty supplies. One thing in my bathroom that I am not crazy about is the plastic covers I use on each of our tooth brushes. I try to replace the covers each time I change out our tooth brushes (every 2-3 months), but once those caps are used I can’t just toss them into the recycling bin. So they end up in our landfill. I also worry about germs and viruses gathering on our toothbrushes. Keeping them covered and in the medicine cabinet creates a nice dark, damp place for little bugs to breed. If you’re like me, you don’t have time for stomach bugs and viruses! So, when Lisa Smith, Executive Vice President of IntelliDent Products contacted me for a review I was excited to try these out! Lucky for you Dear Readers, she was generous and sent extras to GIVEAWAY! These covers are breathable, dry quickly and perform like a surgical mask for your tooth brush! The plastic covers keep the toothbrushes damp and collect tooth paste teaming with bacteria. Yuck! Each cover blocks against 99.9% of airborne and surface bacteria. (Did you know your toilet can contaminate your bathroom surfaces within a six foot radius in you bathroom?). The antimicrobial preventive protection of these covers lasts up to 7 days, then you can toss into the trash. It takes up less room in the can and degrades much faster than plastic. Covers are individually sealed to ensure a fresh product every time. The covers are so easy to slide over a tooth brush my five year olds don’t need any help. (However, they are disappointed they can not select their favorite colors and decided to add a sticker to their covers). My family started using these covers over a month ago. Now that I know the benefits and can see the difference, I won’t be using those plastic covers any more! IntelliDent products are made in the USA by a women owned company. They also make a Mouth Guard Shield. The covers are not available in stores, but are available online at Walmart.com, Drugstore.com, Walgreens.com . Orrrrr, you can just enter here for your very own 10 pack to try! TWO lucky readers will win! Don’t forget there is always a chance for bonus entries! 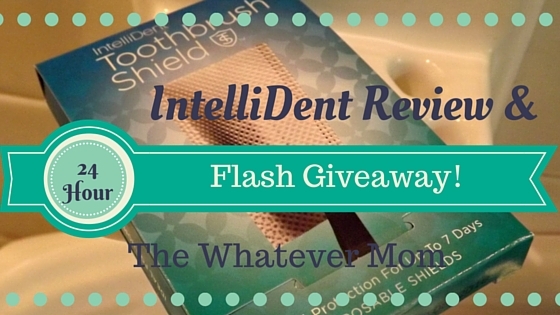 The Whatever Mom was provided with free samples of IntelliDent Toothbrush Shields in exchange for an honest review. All opinions expressed in this post belong solely to The Whatever Mom. If you have never had the pleasure of reading a book from Barefoot books, allow me to introduce you! My friend Gloria first shared these books with me when our kids were just babies. I was immediately drawn to the rich illustrations and the wonderful positive messages of each story. Barefoot books began in the early 1990’s as a way to honor children’s stories from all over the world. The diversity offered through Barefoot books is a great introduction to other cultures, different abilities and empowered child characters. There are books for children of all ages and stages. Your kids will immediately love the colors, the beautiful illustrations and become captivated by the stories! 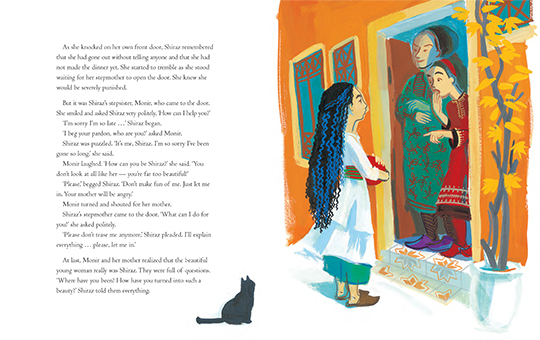 The Girl With A Brave Heart – a story about Shiraz, a kindhearted young girl growing up in Tehran. She is miserable living with her stepmother and stepsister because they treat her like a servant. A powerful story about patience, perseverance and empathy. Lin Yi’s Lantern– a heartwarming story shows the rewards of putting others first, and includes educational notes at the end about the Chinese moon festival. 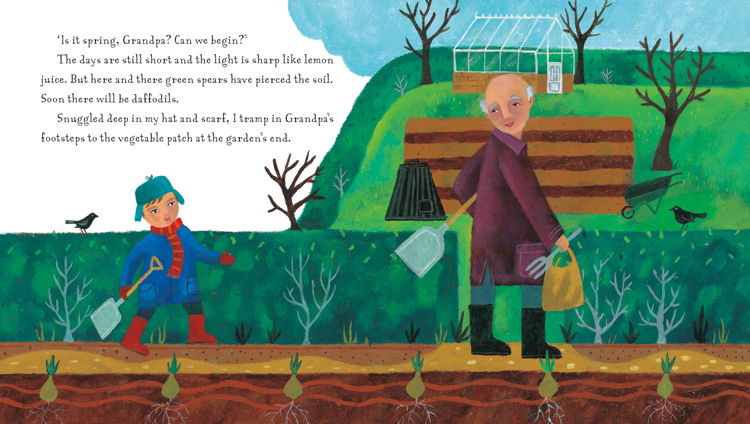 Grandpa’s Garden – kids are drawn in by the poetic language and warm illustrations. It creates the excitement of watching things grow! 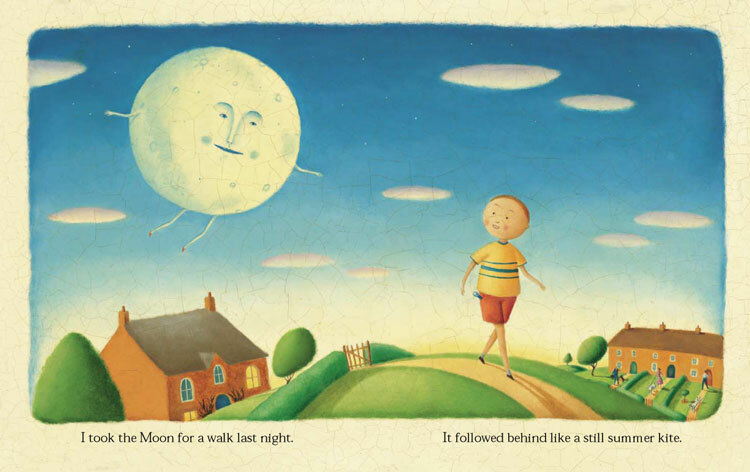 I Took the Moon for a Walk – follow a young boy and the moon as they overcome the fear of the dark and discover the world at night. The end of the book includes notes about the moon and plants and animals that thrive in the wee hours of the night. Barefoot Books are my favorite books to buy for my kids! I try to include a handful of new ones each year in our book a night Christmas countdown! The books are durable and illustrated with unique artwork. To purchase Barefoot Books you typically host a party (at home or online) where you earn free books and a discount. But, just for being my reader you don’t need to host anything! My very generous friend Heather is offering a 30% discount on any book orders placed on Black Friday THROUGH Cyber Monday (by 8 p.m.)!!! For every order over $50 Heather will donate one book to a sick child through my charity Operation Christmas Cheer! You can tick off Christmas gifts AND do something good in less than 10 minutes!! No standing in line at 5:00 a.m.! How convenient is that?!? To receive your 30% discount you must SHOP Heather’s Barefoot Ambassador website and then email your order to: littlevillagebooks1@gmail.com. Write “Whatever30” in the subject line to get your EXCLUSIVE discount! 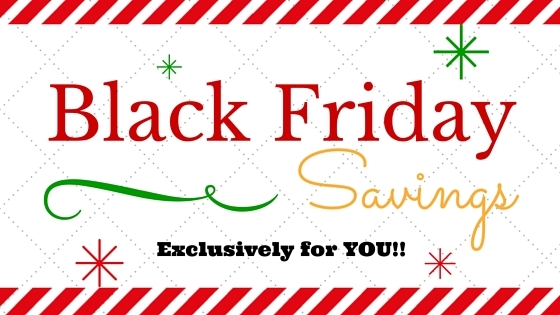 Go ahead do-gooder, shop and save away! Put a smile on your kids faces and bring some cheer to kids in and out of the hospital during Christmas! (Tip: The website allows you to take a peek inside of each book! Just click the “Step Inside” circle on the corner of the book cover!). 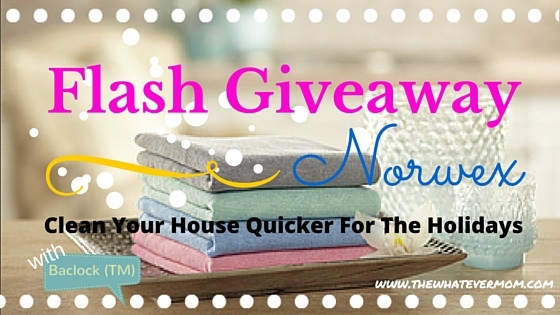 **FLASH GIVEAWAY** Get Your Home Holiday Ready Faster With Norwex! I had never heard of Norwex when my friend Rebecca invited me to a Facebook online party. I thought I’ll just look around and order something small so I can help her out. I honestly never, ever thought this stuff was going to work. 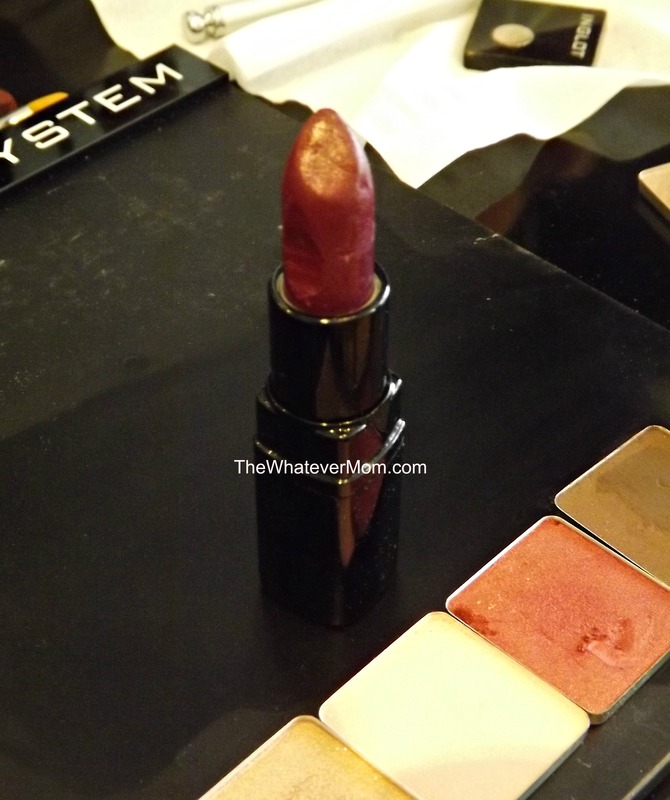 I scoured the Internet for any red flags and negative posts about the company and the products. All I found were some very happy customers! 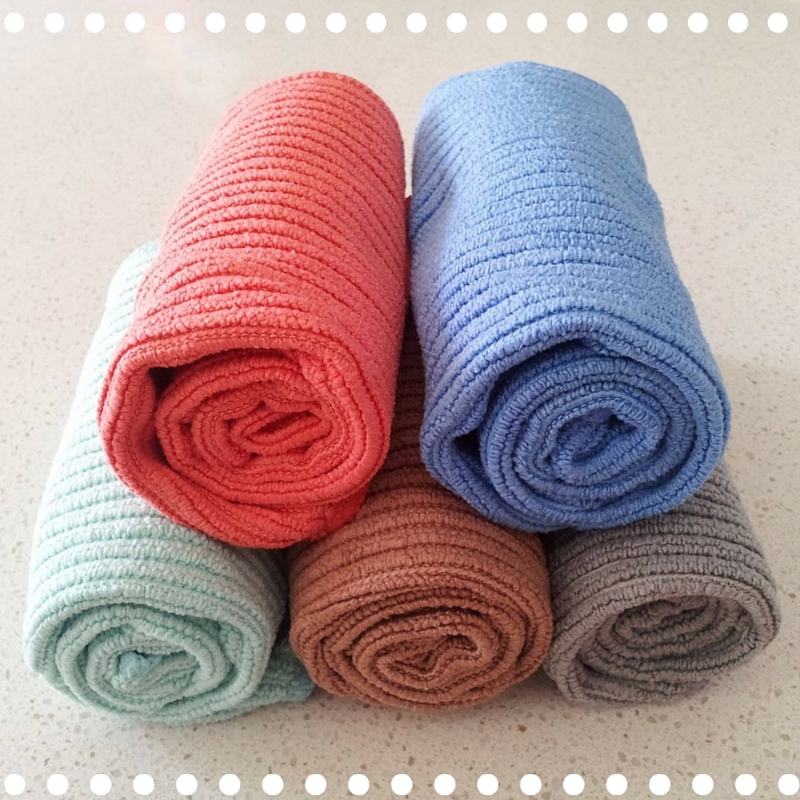 The first products I fell in love with were the spirinets and the kitchen cloth. Brace yourselves, because what I am about to show you is truly horrifying! The inside of my microwave. (You may want to remove the kids from the room). Normally, I’d spend 20 minutes scrubbing one small area at a time with soap and water. With this microfiber Kithcen cloth I finished cleaning the entire microwave in less than five minutes using just water! What impressed me most is this cloth cleaned up more stuck on food in one swipe than my regular kitchen sponge. Three parties later and I am hooked on these products! Now I’m in love with the Enviro Cloth! Lucky for you because you might be the winner of this weeks FLASH GIVEAWAY!! ONE reader will win TWO FREE Enviro Cloths! 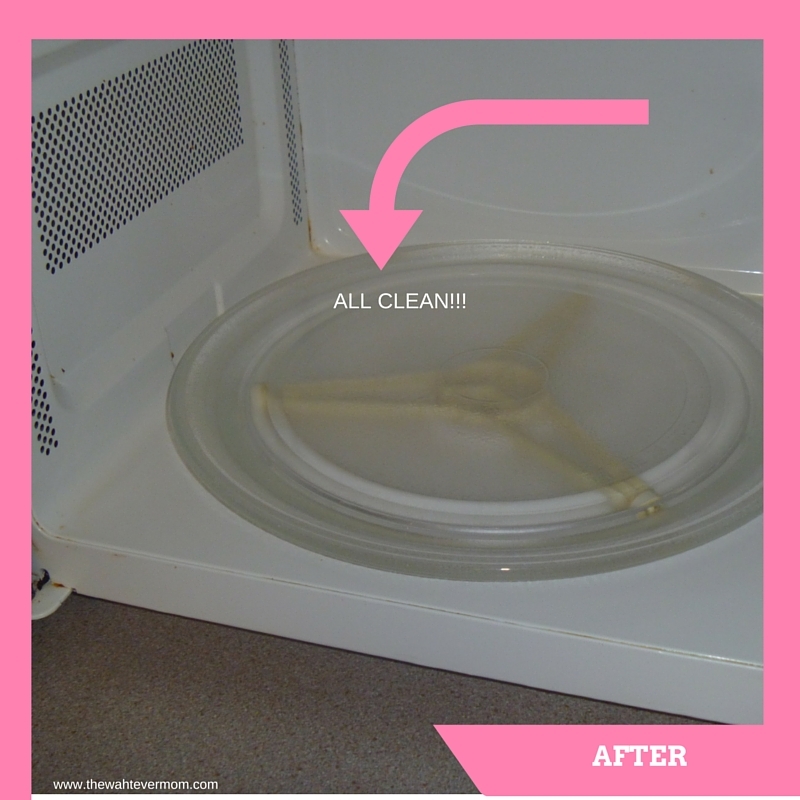 The Enviro Cloth cleans just about everything in your house using ONLY WATER! 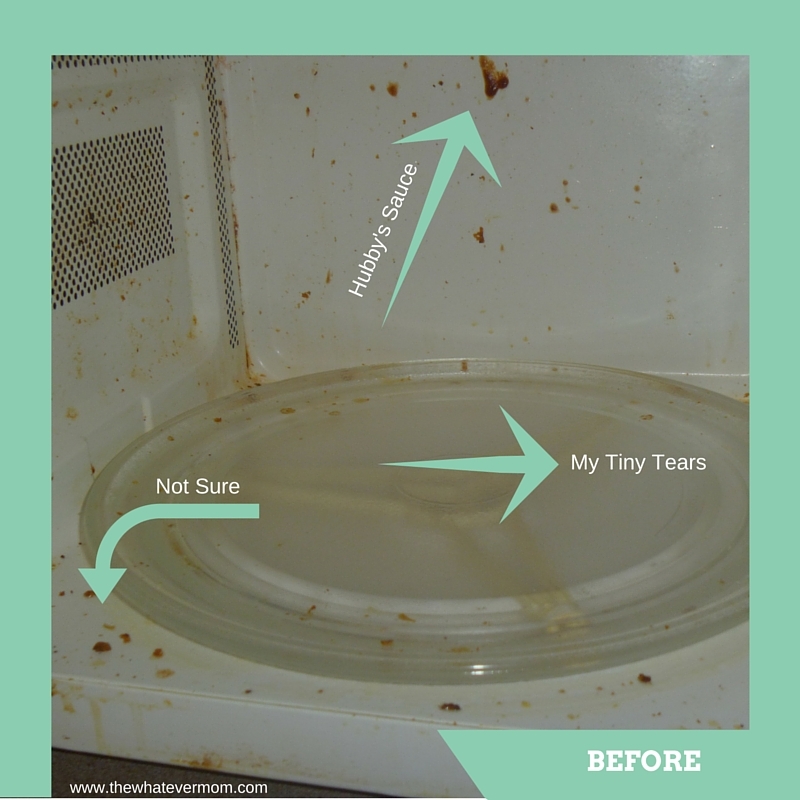 No need for chemical cleaners! You can dust with it, clean counters and table tops, or heavier stuff like spills on carpets and couches. One Enviro Cloth reduces chemical and water use by 90%!! It lasts for 500 washes or 10 years! 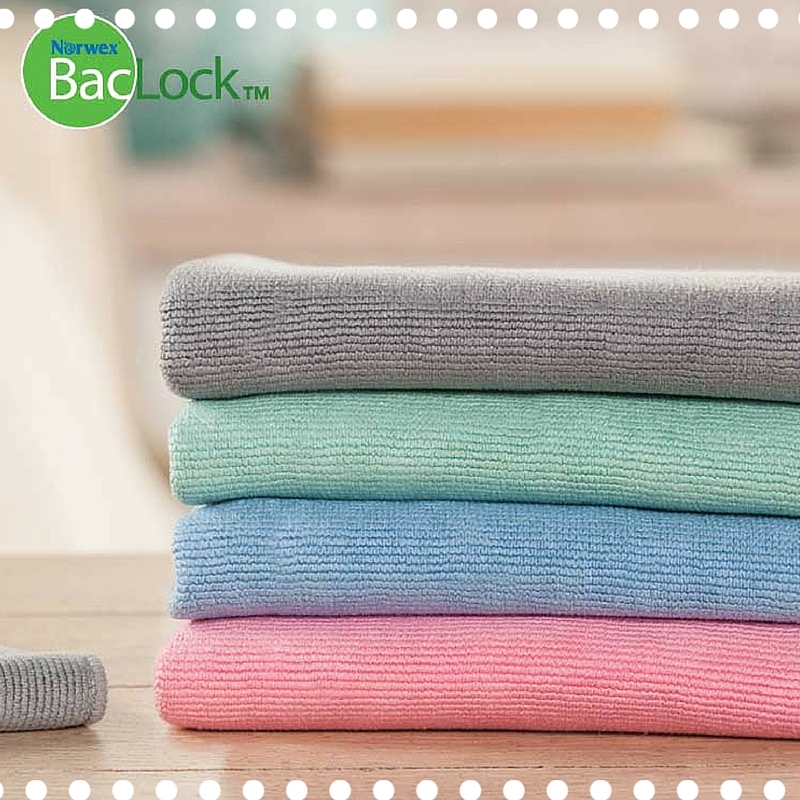 The BacLock (TM) technology has silver antibacterial fiber melted into each cloth. The silver inhibits bacterial odor, mold, and/or mildew growth within the cloth AND it removes 99% of bacteria with just water! Check out Rebecca’s blog for details on how BacLock technology works, and check out videos of Rebecca using the cloths in her own home! I am so excited to use my Norwex cloths to clean before the holidays!! The micro fibers pick up so much more dust and debris than other cloths, so it’s a quicker more efficient way to clean! Just one cloth can clean my entire bathroom, or kitchen without any chemicals! No need to carry a bunch of cleaners from room to room. I simply rinse with water between uses and hang it up to dry. Once it is completely dry the silver is again ready to kill bacteria!! Curious to know how YOU can spend less time cleaning and more time enjoying the holidays? 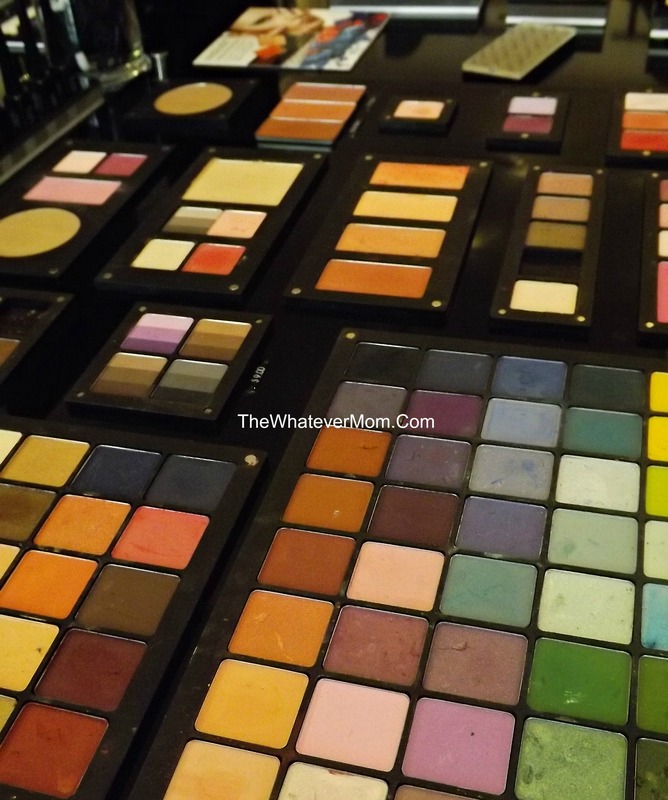 My friend Rebecca is working on something special exclusively for The Whatever Mom readers! Click here to join her Norwex Customer Club on Facebook and send her a message that The Whatever Mom sent you! Then, Join us for a LIVE Facebook chat on Friday November 20th at 9:00 p.m.! Rebecca will send you the link to our private event when you join her Norwex Customer Club. I do not like a hard sell! So, I love that Rebecca truly enjoys sharing her honest experiences with Norwex. She is not pushy with sales, and is happy to answer any and all questions you have! ONE lucky winner will get TWO Enviro Cloths for FREE!! Plus a FREE sample of the UPP detergent!! You have 17 Hours to enter before the winner is announced on The Whatever Mom Facebook page! 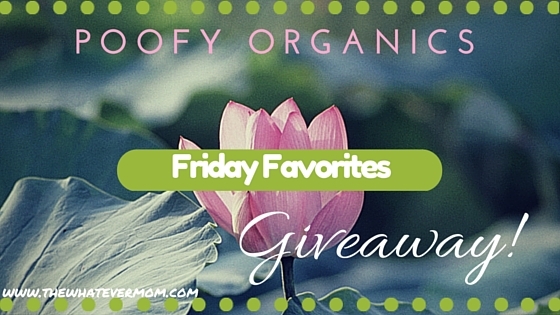 Friday Favorites – Poofy Organics GIVEAWAY! 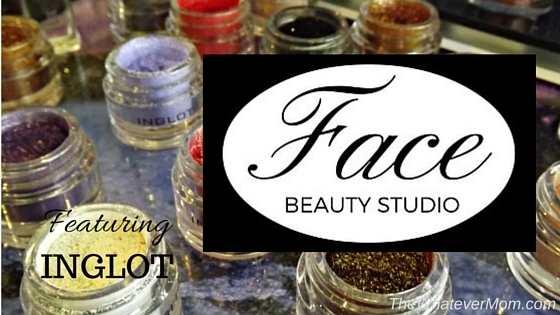 Poofy Organics does not offer samples of products for personal consumption, or review. They are a small family run company and unable to fulfill sample requests. No financial compensation was received for this review. All honest opinions belong solely to The Whatever Mom. Does facing hundreds of little ghouls and goblins, princesses and pirates make you break out into a cold sweat? No worries! 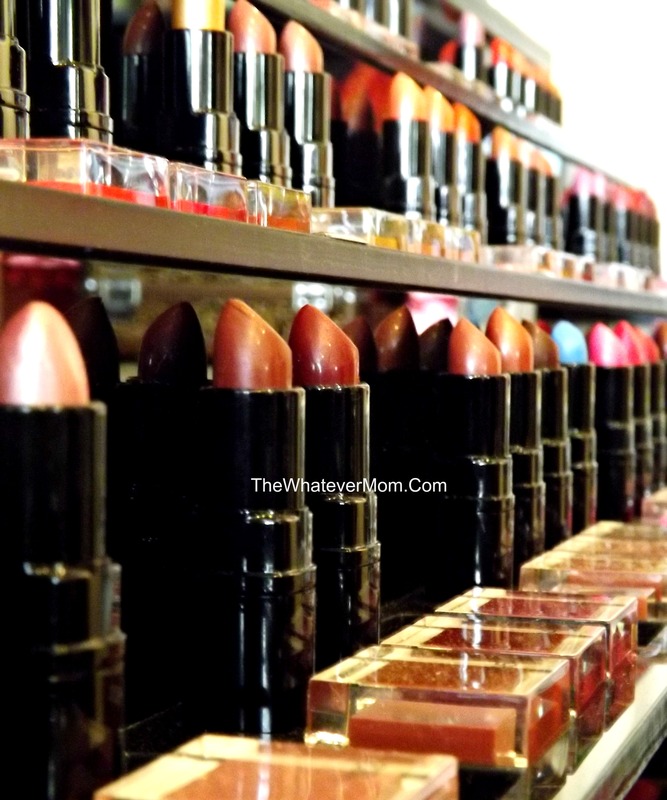 I’ve got you covered with this weeks Friday Favorites and a special give away! 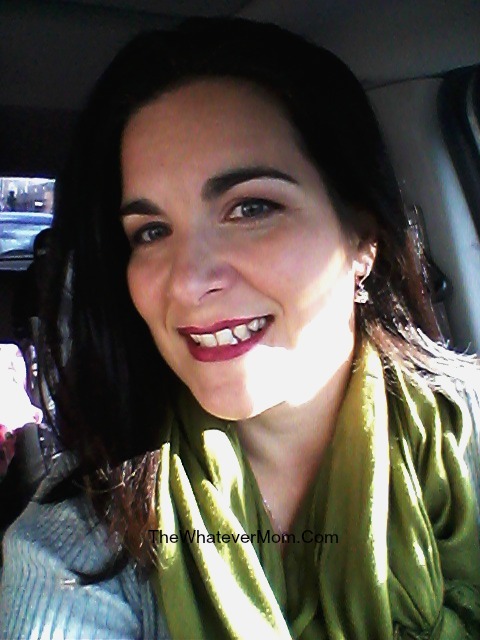 First, let me share with you a little bit about why I love Poofy Organics. This is a very small, family run company that is dedicated to producing small batches of product made by hand. This means significant quality control measures and higher standards for production methods. You can visit their website to meet the team and for an inside look at their production. They are also one of a few USDA Organic Certified personal care companies (but, not every single ingredient has an organic counterpart so organic ingredients are listed individually). I ordered a few hair care products for my girls. They have thick hair that tangles easily. 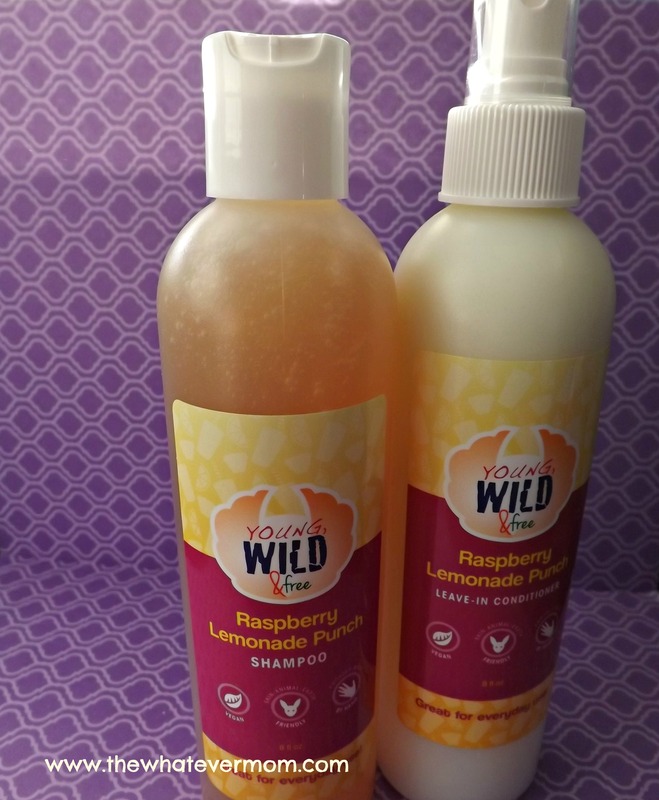 So, I purchased the Raspberry Lemonade Punch Shampoo and Leave in Conditioner from the Young Wild and Free kids line. Now that my kids are in school I worry about lice so I also purchased the Organic Lice Prevention Spray (also comes in a shampoo). All the products are toxin free and use mostly essential oils. I love that the website lists every ingredient in each product so you know what you are getting before you buy. 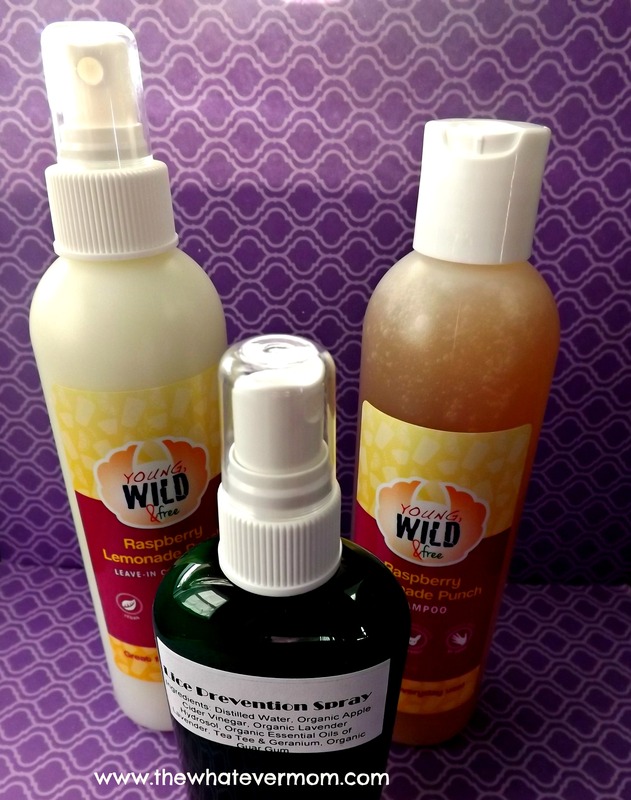 Each product I purchased is labeled as vegan, eco friendly, cruelty free and made by hand. (Except for the lice prevention spray- it is so new they haven’t even designed a label for it yet). The only thing about the shampoo that I don’t like is that it is not tear free. So, we have to be very careful while shampooing. Otherwise, these products smell great and my kids get excited to use them. And, I like that I can pronounce every ingredient. Now my next product of choice is the Max Deo. It’s a natural deodorant. I have been reluctant to make the switch to natural deodorants because well, in the past they’ve never worked for me. My friend Rachel and Poofy Organics Guide gave me a deodorant to try. The results are it works! I started using the Peppy Mint a few weeks ago and so far it has worked just as hard as my traditional deodorant. It absorbs quickly and doesn’t leave a white, flaky residue. 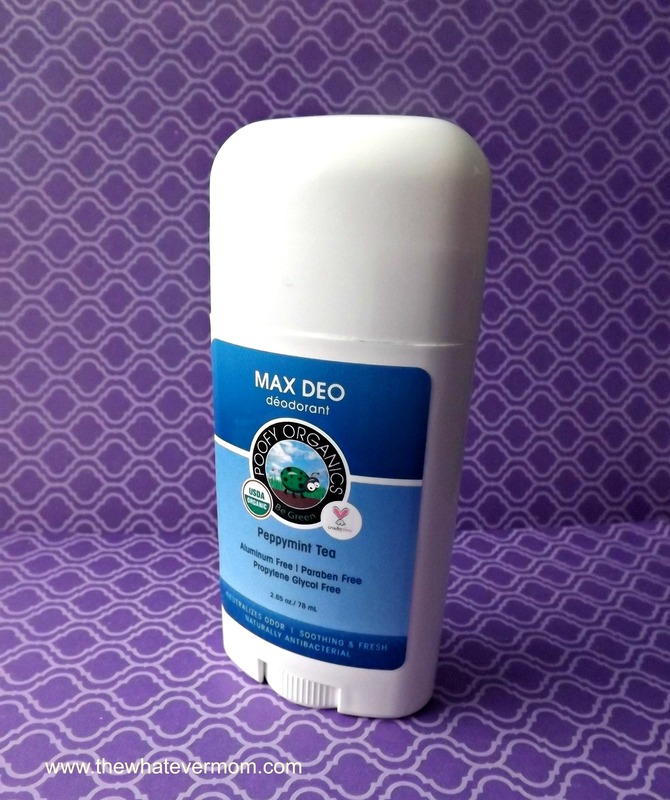 I love it so much I’m giving away one Peppy Mint Organic Max Deo for you to try!! Just follow the Rafflecopter link below to enter for your chance to win! One lucky reader will be chosen at close of the contest on Sunday at 12:00 Midnight EST. Winner announced on my Facebook page on Monday morning!! (If you aren’t following already head over there now!). OK, so you won’t receive this in time to get you through the Halloween rush, but it will arrive in time to get you through Thanksgiving with the in-laws! The Whatever Mom is a full time wife and twin mama living on coffee and wine. She enjoys the pure rush of cleaning the BIG potty between loads of laundry. It is her dream that moms everywhere accept and embrace the Whatever Mom philosophy which can be found here, Find her two party Body Beautiful project here and here. 4 Easy Gift Giving Traditions AND A Giveaway! My computer is FINALLY virus free and back home on top of my desk!! I’m so excited I feel like giving something away! But what? Hmmm… my stapler is pretty cool and useful. Nah. It is Christmas so I’ve got to be a little generous. 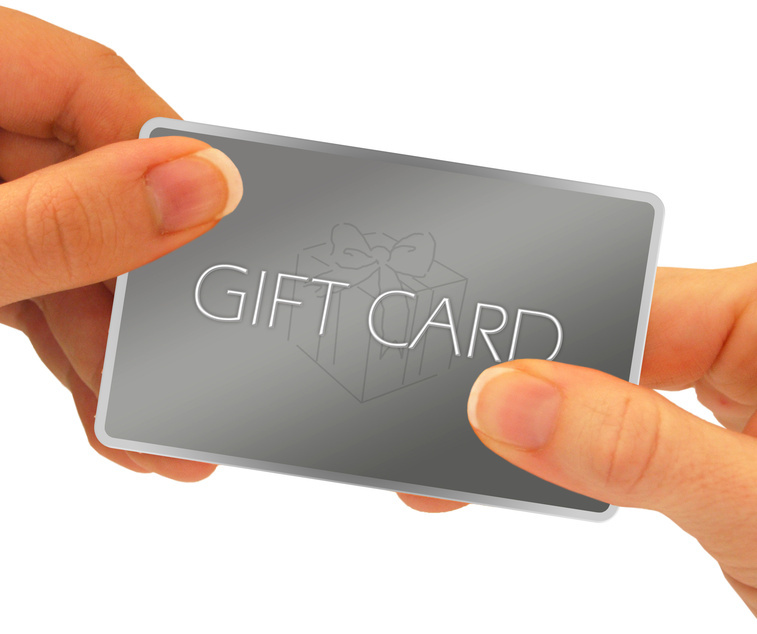 How about a $25.00 gift certificate to Toys R Us? YES!!! So, I am going to need you to share my blog with your friends! Not my Facebook page (although that is pretty fabby too) my actual blog! Once I reach 500 blog followers I will pick a winner!! To enter you HAVE to comment below THIS post with the number of friends you’ve shared my blog with. Let the sharing begin! I’m sure you have some Christmas shopping to finish up and wouldn’t a gift card to TRU help with that? The sooner we get to 500 followers the sooner you can win that card! Book a night Advent count down. My kids really love this one! It’s basically a whole month of presents before the actual presents arrive. Each night before bed they get to open one book. 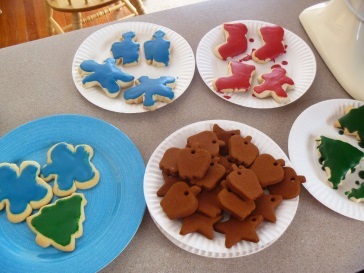 We read the stories while eating Christmas cookies and sipping milk. Some nights they can’t wait to take their book to their room to look it over alone. In their rooms. In silence. I think I love this gifting tradition a little more than they do. I pick up gently used books all year from garage sales and the local libraries for a total of 46 books. The girls get a book a night from Dec. 1st-23rd. On Christmas Eve. they get to open a bigger gift of pajamas. A Cookie for Me, A Cookie for You! Cookies are great for Firefighters, Police Officers, Mail carriers and anyone who likes cookies. We make and frost (poorly as pictured above) several dozen cookies to deliver to our local Fire Fighters and Police Officers. Not only is it a great way to show our gratitude, but this tradition also introduces our kids to important community members. They begin to understand who the helpers are and to not be afraid of the men and women in these uniforms. Fun little crafty cards for neighborhood friends. My little family is really fortunate to live next door to some of the most wonderful people on earth! We like to share some fun homemade crafts with them. 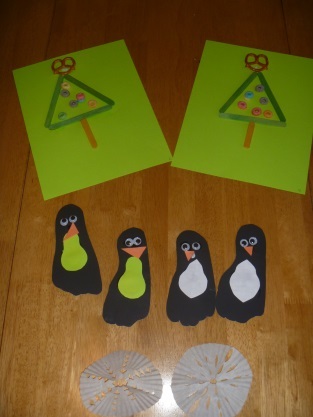 I traced each kids foot to make penguins and added colored paper for the belly, the beak and some googly eyes. We made them into cards and delivered personally. We made the trees by gluing Popsicle sticks, fruit loops cereal and a pretzel to green paper. These are really easy crafts for the age 2-3 crowd. Hand print snow man ornaments are great for the grand parents! Each year we buy a new ornament for our kids to put on the tree. The point is to one day hand them a set of ornaments for their own tree in their home. 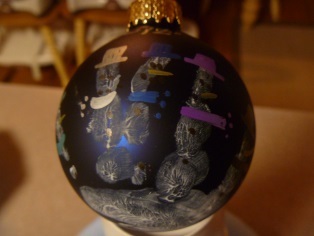 We also make one hand print keepsake ornament. This way we’ll have a set of ornaments ornaments for our own tree when the kids take theirs. Don’t forget to share my blog with friends and comment below how many friends you shared with! Once I reach 500 followers I’ll pick a winner for a $25.00 Toys R Us gift card! Comments Off on 4 Easy Gift Giving Traditions AND A Giveaway!